Arizona Gov. 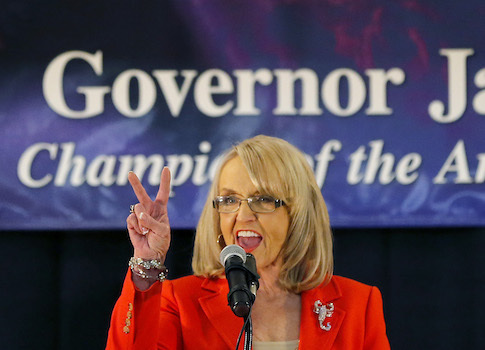 Jan Brewer (R.) signed into law two key piece of legislation that will expand school choice to more children, giving parents the opportunity to spend funds slated for public schools on a school that meets their child’s needs. Brewer’s move comes weeks after the state prevailed in a three-year lawsuit by a local teachers union that challenged the constitutionality of the state’s school choice program, officially called Empowerment Scholarship Accounts. "Every child is unique: Kids should not be trapped in schools that treat them like they're all the same," said Darcy Olsen, president and CEO of the Goldwater Institute, in a prepared statement. The group’s namesake, former Sen. Barry Goldwater (R., Ariz.), developed the concept of education savings accounts (ESA). "Education savings accounts put parents in the driver's seat to choose the education experience that fits their children's needs best," Olsen said. As previously reported, the local teachers’ union, the Arizona Education Association (AEA), was fighting the expansion. They called it a "boondoggle" and "unconscionable" that legislators would approve it. After their loss in the courts, AEA president Andrew F. Morrill wrote an op-ed piece about expanding ESAs. "Certain Arizona extremists want to expand a voucher-like program that fails to increase student achievement while costing taxpayers untold millions of dollars — without a shred of proof of results," he wrote. The Arizona Federation of Teachers also opposed the expansion of the ESA program. State Sen. Kimberly Yee (R., Phoenix) introduced the legislation to expand the ESA program to school children on the free or reduced lunch program, siblings of the disabled, and children of first responders. The children of fallen soldiers will also now be eligible for the accounts. The ESAs allow parents to use 90 percent of the funds that would have been spent at a traditional public school toward a school of their choice. Nearly one in five Arizona families was previously eligible for an account. They included children in failing schools, those adopted out of the state foster system, special-needs children, and those of active-duty military. This entry was posted in Issues and tagged Arizona, Jan Brewer, School Choice. Bookmark the permalink.